A small device with the best oral technology! 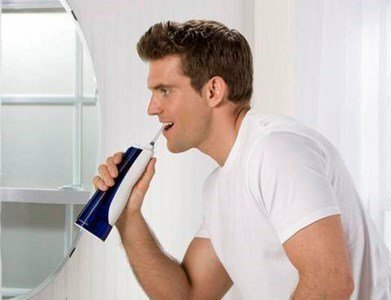 Waterpik Cordless Plus Oral Irrigator WP-450 Portable is the best portable option of oral health! Waterpik Cordless Plus provides a unique combination of water jets with adequate pressure to massage and stimulate the gums, removing plaque and bacteria deeply lodged between the teeth below the gum line, where traditionally brush and dental floss They do not reach. Oral irrigator is the only clinically proven efficacy, and 3x more effective than the traditional G-string in reducing plaque, gingivitis and gingival disease, and also in the removal of plaque that accumulates in implants and orthodontic appliances. It is an excellent solution for those who prefer the convenience of a portable sprinkler. Waterpik Cordless Plus includes an ergonomic design with anti-slip handle, easy to handle and fill the tank, and with a dual pressure control, low pressure for sensitive gums and high pressure for a deep cleaning. Quick and easy to use, the Waterpik Cordless Plus can be used with favorite mouthwash, leaving a clean and refreshing mouthfeel.